Chromosomal annotations of HIV-1 integration sites associated with intact and defective proviral sequences. (A and B) Pie charts showing proportion of intact and defective HIV-1 sequences located in genic versus non-genic/pseudogenic regions (A), and with the same or opposite orientation relative to host genes (among sequences integrated in genes; B). Integration sites associated with multiple genes and mixed orientations to host genes were not considered for the analysis in B. Significance was tested using 2-tailed χ2 tests; nominal P values are reported. (C and D) Pie charts indicating the proportion of intact and defective HIV-1 sequences located in regions with defined repetitive genetic elements (C) (SINE, short interspersed nuclear element; LINE, long interspersed nuclear element; LTR, LTR retrotransposon; DNA, DNA transposon) and in exons or introns (D). (E–G) Ontology analysis of genes harboring defective and intact HIV-1 sequences. Data represent a categorization of genes harboring intact or defective HIV-1 sequences according to defined formal functional entities (E). (F) Top ten canonical pathways predicted by Ingenuity Pathway Analysis for genes containing intact or defective proviruses; x axis shows corresponding –log(P value) for each pathway using right-tailed Fisher’s exact tests, with a threshold of –log(0.05) marked as a dotted line. RhoGDI, Rho GDP dissociation inhibitor. 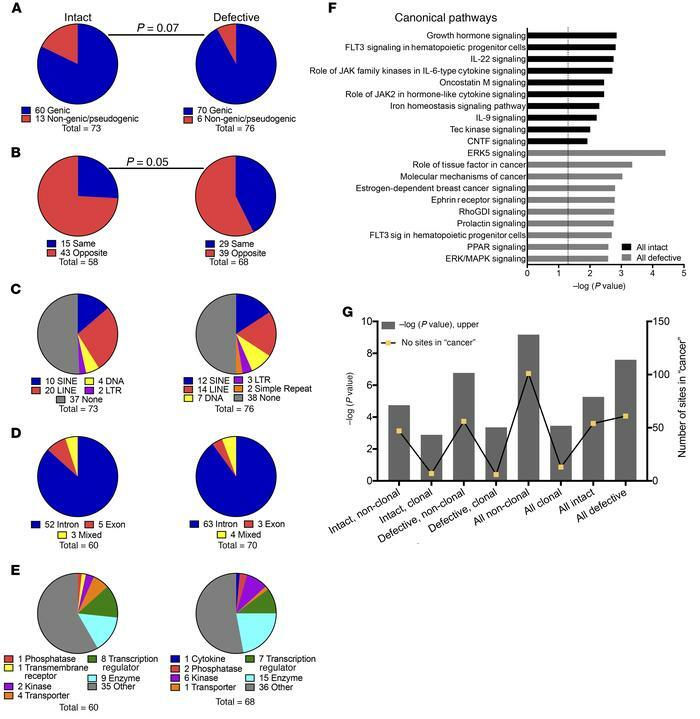 (G) Positioning of intact and defective HIV-1 proviruses in cancer-related genes. Left y axis shows upper limit of the –log(P value) for each indicated category (Ingenuity Pathway Analysis–based right-tailed Fisher’s exact tests); right y axis depicts the number of sites identified in the “Cancer” category in the different gene groups. For A–G, clonal sequences were counted only once.